I have been developing an interpersonal reconceptualization of defense processes called interpersonal defense theory (e.g., Westerman & Steen, 2007). The theory is “interpersonal” in the general sense of that term, which is to say that it focuses on what goes on between people. Along those lines, it reflects the influence of the interpersonal school of psychoanalysis (Horney, 1939, 1945; Sullivan, 1953), communications theory (e.g., Watzlawick, Beavin, & Jackson, 1967), and work on discourse analysis (see Westerman, 2011a). The theory also is “interpersonal” in the more narrow sense that it incorporates ideas from the interpersonal circumplex tradition, specifically, Benjamin’s (e.g., 1979) Structural Analysis of Social Behavior (SASB). Interpersonal defense theory has many implications for clinical work. In what follows, I offer a brief summary of the theory and then discuss some implications that draw heavily on SASB. I then go on to illustrate my points about implications with a clinical example. As in traditional psychoanalytic theory, interpersonal defense theory focuses on how individuals negotiate conflicts between their wishes and fears. However, whereas psychoanalytic theory treats wishes and fears as intrapsychic pheneomena, views defenses as intrapsychic processes too (the ego mechanisms of defense), and maintains that defenses aim at regulating internal states (anxiety, guilt, and self-esteem), according to interpersonal defense theory, defenses primarily are interpersonal behavior patterns of a certain kind that individuals employ to influence what happens in their interpersonal relationships, specifically, how the other person in a relationship acts toward them. Wishes and fears refer to actual interpersonal outcomes, not intrapsychic phenomena. The theory does include intrapsychic phenomena, but treats them as subprocesses nested within interpersonal phenomena. Interpersonal defense theory focuses on how individuals engage in interactions that are conflict-ridden in the sense that if they pursued a response of central importance to them in a relationship (their key wished-for outcome), this would open up the possibility that some particular negative response that is also highly salient for them (their central feared outcome) might occur. Some people attempt to negotiate these conflicts by employing interpersonal defenses. These defenses are characterized by how a person’s contributions to discourse are organized over time. They are marked by recurring patterns of failing to coordinate one’s contributions to an exchange with the other person’s contributions and with one’s own prior contributions. Behaving this way makes it possible for a person to pursue his or her wished-for outcome in such a manner that it becomes very unlikely that the feared outcome will occur – even though pursuing the wish typically opens up that possibility. Note that the theory incorporates an idea about defenses from psychoanalytic theory that is often neglected by psychoanalytically-oriented theorists, researchers, and clinicians, which is that defenses are attempts to pursue wishes as well as avoid fears (see Shafer, 1968). Interpersonal defenses “work” in the sense that they make it less likely that feared outcomes will occur, but they “feed forward” to affect how the other person in a relationship behaves in several other ways as well. According to the theory’s tenets about these feed-forward effects, although a person’s defensive behavior includes attempts to pursue his or her wish, it actually makes it unlikely that the other person will respond in the wished-for manner. In addition, defensive patterns promote positive outcomes that are distinct from the central wish and negative outcomes that are distinct from the central fear. Therefore, an important point of the theory is the idea that we need to differentiate among different kinds of positives responses and among different types of negative responses. According to interpersonal defense theory, the theoretical tenets I have briefly presented apply across individuals, but every person has his or her own profile of wished-for outcome, feared outcome, defensive/noncoordinating pattern, negative outcomes distinct from the fear that are promoted by the defensive pattern, and positive outcomes distinct from the wish that the defensive pattern often leads to. This profile can be summarized in a case formulation. Note that interpersonal defense theory differs from the notion of a self-fulfilling prophecy (Downey, Freitas, Michaelis, & Khouri, 1998; Hilton, Darley, & Fleming, 1989; Wachtel, 1994, 1997, 2008), because it maintains that problematic, defensive behavior does not lead to the outcomes an individual fears. Instead, once again, according to interpersonal defense theory, defensive behavior typically leads to certain negative outcomes that are different from the outcomes the person most fears. This point suggests that therapists are making a mistake when they reason along the lines of the self-fulfilling notion that the negative responses a patient recurrently experiences must be what that person is trying to avoid (more on this shortly). This contrast with the self-fulfilling prophecy notion also leads to a different account of why problematic, defensive behavior patterns persist (see Westerman, 2011b). Interpersonal defense theory offers a new way of conceptualizing transference and countertransference phenomena because the interpersonal phenomena it considers occur in the therapy context as well as in other parts of a patient’s life. The theory suggests that we can view transference as the appearance of a patient’s defensive, noncoordinating pattern in his or her relationship with the therapist. Also, we can view countertransference as the appearance in the therapist’s behavior of the feed-forward effects of the patient’s defensive pattern. Studies that have been conducted to date on a number of the theory’s tenets have offered support for those hypotheses. These investigations have included experiments, therapy process-outcome studies, and theory-building case studies (for a summary, see Westerman & Muran, 2014b). According to the theory, the key outcomes to consider are a patient’s wishes and fears regarding how other people will respond to him or her and how other people actually do respond to the patient. Outcomes concerning what are typically referred to as a patient’s “internal” experience – for example, feeling ashamed, guilty, inadequate, self-confident, or lovable – are important to consider, but they play secondary roles. Hence, according to the theory, therapists make a mistake when they focus exclusively on such “inner” experiences and neglect interpersonal outcomes. Another important point is that it is crucial to differentiate among different kinds of negative interpersonal outcomes and among different kinds of positive outcomes. I believe clinicians often treat what are really quite different outcomes as if they were the same, for example “validate” and “nurture,” or “criticize” and “reject.” SASB helps us avoid these missteps by pointing out how different kinds of responses vary with respect to affiliation and/or interdependence. The point here does not so much concern a lack of precision in how therapists talk about things in sessions (e.g., if they use one positive term when they really mean to refer to a different kind of positive outcome), but how therapists actually understand a case, that is, do they think about their work in a way that fails to make differentations that are very important. 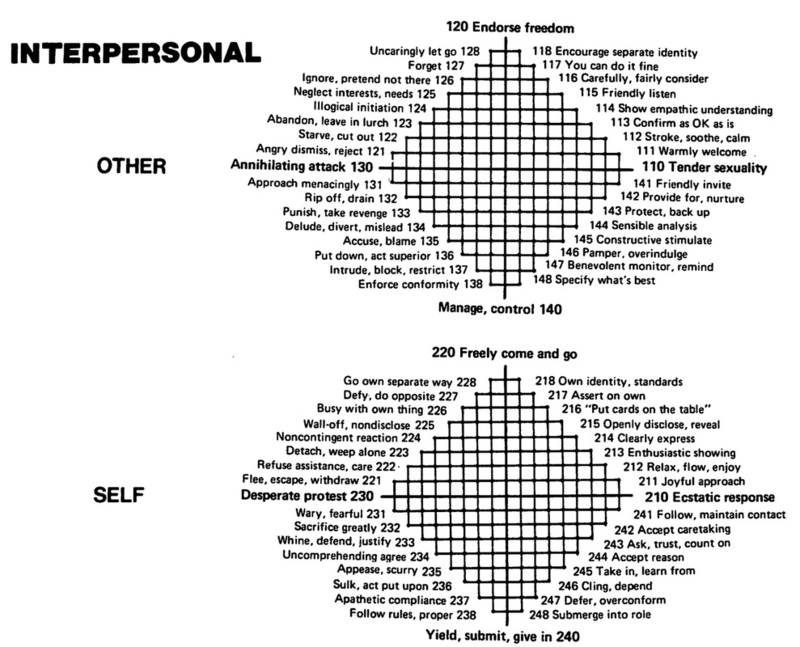 Consider the “validate”/“nurture” example: I believe that the term “validate” is best understood as referring to interpersonal responses in quadrant 1, roughly points 113 to 118 in the full SASB model (see Figure 1). Reference to the figure makes clear that such responses are quite different from “nurturing” responses (142) on the interdependence dimension. They are also different on the affiliation axis if we are comparing 142 to points 116-118. Indeed, in this example, we see that SASB enables us to make even more fine grain differentiations, because while we might say that all of the points 113-118 could be called “validating,” that range of points in the model actually includes different types of responses. Figure 1. Structural Analysis of Social Behavior (SASB). The figure omits the introject surface and includes only the two interpersonal surfaces of the SASB model. From Benjamin, L.S. (1979). Structural analysis of differentiation failure. Psychiatry: Journal for the Study of Interpersonal Processes, 42, 1-23. Reprinted with permission of The Guilford Press. According to interpersonal defense theory, differentiating among positive interpersonal responses and also among negative interpersonal responses is very important because different positive responses play very different roles from each other in key interpersonal processes and the same is true for different negative responses. One point here is that therapists should recognize just what kind of negative responses are examples of a patient’s central fear. Unfortunately, clinicians very often treat the negative responses a patient frequently experiences as the patient’s central fear (following the logic of the self-fulfilling prophecy notion and also the patient’s own concerns about the negative responses he or she recurrently encounters), even though those responses are likely to be different from the patient’s central fear. Clearly this can lead to problems in treatment. A therapist is not likely to be as helpful as possible if he or she focuses on the wrong thing. If a therapist does consider the possibility that a patient’s central fear may be different from the negative responses he or she often encounters, then SASB can be very useful. Going back to an example I briefly mentioned earlier, proceeding along these lines a therapist may recognize that a patient often encounters “criticism” and that in the particular case in question this term (which I believe can actually refer to very different kinds of interpersonal outcomes) is best understood as “accuse, blame” (135) and “put down, act superior” (136). Furthermore, the therapist also might realize that these outcomes are negative responses distinct from the patient’s feared outcome, which in the case in question is “angry dismiss, reject” (121). SASB helps us see that this is a different kind of negative outcome as reflected by the different positions of “accuse, blame” and “put down, act superior” versus “angry dismiss, reject” on the interdependence dimension especially but also on the affiliation axis. If the patient encounters “accuse, blame” and “put down, act superior” responses, but not “angry dismiss, reject,” he or she is successfully avoiding the feared outcome. Therapists often think about defenses as if they aim solely at avoiding fears, but interpersonal defense theory suggests that this is a mistake because defenses also include attempts to pursue wishes. This point also often applies to work by therapists who do not take a psychoanalytically-oriented approach. These therapists frequently understand their patients’ coping mechanisms, dysfunctional behaviors, and irrational cognitions as if they only constitute attempts to avoid negative outcomes. Another observation is closely related to the preceding point: I believe that failing to recognize the role defenses, coping mechanisms, and so forth play with regard to wishes is part of a more general problem. Many therapists only consider their patients’ fears and do not consider their wishes at all. In many cases, we can say that therapists implicitly take their patients’ wishes to be simply that “the fear won’t occur.” By contrast, according to interpersonal defense theory, it is crucial to recognize a patient’s wish. To be sure, most therapists are aware of some of their patients’ concrete wishes, for example, wanting to succeed at work. Such goals are important, but interpersonal defense theory maintains that in many clinical situations, including cases in which presenting problems do not concern interpersonal issues, it is important to appreciate patients’ interpersonal wishes. Quite often, this is far from easy to do. Indeed, even if a patient says that he or she wants to have a better relationship with his or her spouse, important distinctions remain to be made. SASB can be very helpful for this task. Is the central wish for validation of autonomy, or communing/nurturing, or for guidance/caretaking? I believe that patients and therapists typically find it quite difficult to identify the key wish. Of course, it becomes quite unlikely that the wish will be identified if the therapist doesn’t even attempt to do so. Given that therapists often don’t consider their patients’ key wishes, it is not surprising that they also fail to differentiate between those key wishes and the positive outcomes a patient experiences that are distinct from his or her key wish. Nevertheless, it is important to recognize those positive outcomes and the roles they play. For one thing, positive outcomes distinct from patients’ wishes contribute to maintaining defensive behavior. A related point is that when a therapist responds to a patient in positive ways that are distinct from the patient’s wish, this leads to the false impression that the alliance is a good one (see Westerman & Muran, 2014b). Once again, SASB is a useful guide. For example, it can help a therapist recognize that although a patient’s interpersonal behavior often leads other people to offer the patient guidance and caretaking, the patient actually wishes for communing/nurturing responses from the significant people in his or her life. The considerations I have just presented come into play in two main ways. The first way concerns therapeutic tasks. Interpersonal defense theory suggests that therapists should think about their work in a manner that incorporates the points I have enumerated when they offer interpretations, evaluate patients’ progress, give homework assignments, and so forth. A further comment about evaluating patients’ progress is in order. If a therapist fails to recognize a patient’s key wish, it is quite possible that he or she will fail to appreciate gains the patient makes. Recognizing gains is extremely important and, therefore, this kind of error is quite problematic. The second way in which the points I have offered come into play concerns therapeutic relationship processes. As I noted earlier, in the context of the therapy relationship, interpersonal defense theory offers a way of conceptualizing transference and countertransference phenomena. I believe that when therapists don’t think about a case along the lines of the points I have enumerated, they are more likely to respond to their patients in a countertransferential manner, which is to say behave in ways that include negative responses that are distinct from a patient’s fear and positive responses that are distinct from a patient’s wish. Such responses by a therapist promote continued defensive behavior on the patient’s part and that, in turn, interferes with the work of therapy (see Westerman & Muran, 2014b). By contrast, when therapists behave with their patients in ways that realize patients’ interpersonal wishes in the therapy context, this contributes to positive outcomes by providing corrective emotional experiences that lead to nondefensive behavior by patients and more productive therapeutic work (de Roten & Westerman, 2014). I believe that the suggestions I have offered have relevance across a wide range of therapeutic approaches and are not only applicable to psychoanalytically-oriented psychotherapy, if we think about therapeutic schools in terms of the kinds of interventions they advocate rather than how they conceptualize cases. Interpersonal defense theory does not give priority to insight-oriented interventions and it does not point away from a host of active intervention strategies. I can illustrate a few of the points I have made with some brief comments about a case I discussed at the most recent SITAR conference (Westerman & Muran, 2014a). In contrast to that presentation, however, here I will consider a different session and focus on the implications of interpersonal defense theory for clinical work. Readers also may want to refer to Westerman & Muran (2014b). The patient was a 28-year-old female I will refer to as Sharon. She was treated by a male psychiatrist. Sharon entered therapy because she was having a great deal of trouble getting over a broken engagement, an engagement she had ended. She remained in contact with her ex-boyfriend Jeff (pseudonym). Although she complained about how he acted towards her, which included behaving in a threatening manner, she continued to be in touch with him, often initiating communications. In session 11 of this 30-session brief therapy, Sharon tried to get the therapist to give his opinion about a letter she received from Jeff in response to an invitation she had sent him to go to a show with her. The therapist did not want to give his opinion. Instead, he tried to get Sharon to say what she thought about Jeff’s response. Nevertheless, Sharon repeatedly asked the therapist questions about the letter. She never directly said what she thought about the letter, but it seems clear that she thought that something about it suggested that Jeff still had feelings for her even though he had declined her invitation. The therapist told Sharon that she was confused about the letter and offered the idea that her confusion was an attempt to avoid painful feelings. He tried repeatedly but unsuccessfully to get Sharon to explore this idea with him. Based on interpersonal defense theory, one would arrive at a very different understanding of what happened in this session as compared to the therapist’s formulation and also a very different understanding of the case in general. By focusing on how Sharon was using intrapsychic processes (staying confused) to regulate her inner state (painful feelings), the therapist failed to appreciate key features of Sharon’s interpersonal behavior pattern, including the interpersonal goals of that pattern both with respect to Sharon’s relationship with Jeff and also her relationship with the therapist himself. In this session and quite generally in her life, Sharon persistently, stubbornly pressed on with her point of view and tried to get interactions to proceed along the lines of what she wanted to pursue, but she also repeatedly appeared to agree with and defer to the other person so that she derailed her own repeated attempts to pursue her point of view and, in fact, never made it clear where she stood. This noncoordinating, defensive interpersonal pattern was an attempt to negotiate a conflict that we can describe in SASB terms: Sharon’s wished-for outcome was for others to respond to her in the manner described by the SASB codes “encourage separate identity” (118), “you can do it fine” (117), and “carefully, fairly consider” (116), that is, for others to affirm and appreciate her independence and viewpoint. However, Sharon feared that if she pursued her wish, others would “ignore her, pretend she is not there” (126) and “neglect her interests and needs” (125). This was her primary fear, not the therapist’s idea about avoiding painful feelings. Unfortunately, the therapist did not come to realize that this was Sharon’s fear throughout the treatment. In part, he failed to recognize her key fear because Sharon’s defensive behavior made it possible for her to avoid that outcome. In fact, the therapist behaved in ways that did not include neglecting/ignoring her at all, but rather actively engaged with her with countertransference responses including positive outcomes distinct from Sharon’s wish (benign control, including “sensible analysis” (144), “constructive stimulation” (145), “pamper, overindulge” (146), “benevolent monitoring” (147), and “specifying what’s best” (148)) and negative outcomes distinct from her fear (hostile and hostile controlling behavior, including “accuse, blame” (135), “put down, act superior” (136), “block, intrude” (137), “enforce conformity” (138), “attack” (130), and “approach menacingly” (131)). Jeff did not ignore or neglect her either, but behaved in ways that were marked by negative responses distinct from Sharon’s fear, including hostile and hostile controlling manner. In addition, the therapist’s formulation – that Sharon was confused in order to avoid painful feelings – failed to recognize that Sharon’s defense included attempts to pursue her wish. We can readily identify this aspect of her defense if we focus on Sharon’s recurring interpersonal pattern of coordination breaches. Recall that her defensive pattern included persistent bids to press on with her point of view and get interactions to proceed along the lines of what she wanted to pursue. As suggested by the SASB principle of complementarity, this aspect of her behavior, taken by itself, represents an attempt to pursue her wish because it involved behaving in ways that reflected her “own identity and standards” (218), “asserting on her own” (217), and “putting cards on the table” (216). To be sure, Sharon did not pursue her wish in a straightforward way because she also repeatedly derailed acting independently and taking a stand by appearing to agree with and defer to the therapist and the other people in her life. Nevertheless, it is crucial to recognize this aspect of how she behaved. Unfortunately, the therapist did not recognize this part of her defensive pattern. Furthermore, more generally, he did not come to appreciate that Sharon’s central wish was for others to affirm and appreciate her independence and viewpoint. In the context of the therapeutic relationship, he did not act towards her in ways that realized her wish and he did not understand developments in Sharon’s life outside of the therapy context in light of her wish. In fact, in a session near the end of treatment, he responded negatively (“accuse, blame” (135), “put down, act superior” (136)) to Sharon’s report of some changes she made in the direction of pursuing her wish. I believe that this failure to understand Sharon’s wish, in particular, as well as the other problems I have pointed to regarding the therapist’s role in this case help us understand the outcome of the treatment, which is that the therapy was unsuccessful. I have attempted to point out some ways practitioners can apply interpersonal defense theory in their work and to highlight how useful SASB can be as an adjunct to the theory. I hope that my remarks suggest the promise of interpersonal defense theory as a guide for clinical work. Benjamin, L. S. (1979). Structural analysis of differentiation failure. Psychiatry: Journal for the Study of Interpersonal Processes, 42, 1-23. De Roten, Y., & Westerman, M. A. (2014). Interpersonal defenses and resolution of alliance ruptures: A theory-building case study. Submitted for publication. Downey, G., Freitas, A.L., Michaelis, B., & Khouri, H. (1998). The self-fulfilling prophecy in close relationships: Rejection sensitivity and rejection by romantic partners. Journal of Personality and Social Psychology, 75, 545–560. impressions, and practical implications. New York, NY: Plenum Press. Horney, K. (1939). New ways in psychoanalysis. New York, NY: Norton. Horney, K. (1945). Our inner conflicts. New York, NY: Norton. Sullivan, H. S. (1953). The interpersonal theory of psychiatry. New York, NY: Norton. Wachtel, P. L. (1994). Cyclical processes in personality and psychopathology. Journal of Abnormal Psychology, 103, 51-54. Wachtel, P.L. (1997). Psychoanalysis, behavior therapy, and the relational world. Washington, DC: American Psychological Association. study of interactional patterns, pathologies, and paradoxes. New York, NY: Norton. Westerman, M. A., & Steen, E. M. (2007). Going beyond the internal-external dichotomy in clinical psychology: The theory of interpersonal defense as an example of a participatory model. Theory & Psychology, 17, 323–351. Westerman, M. A., & Muran, J. C. (2014b). Using a discourse-analytic method based on interpersonal defense theory to examine therapeutic alliance processes. Manuscript submitted for publication. Some material in this piece was abstracted and adapted from a manuscript under review by a peer-reviewed journal (Westerman & Muran, 2014b). Correspondence should be sent to the author at the Department of Psychology, New York University, 6 Washington Place, 4th Floor, NY, NY 10003, or to michael.westerman@nyu.edu.